Kilbourne, who joined Mazda in 1982, was a key member of the advanced product planning and market research team for more than 15 years at Mazda’s R&D Center. 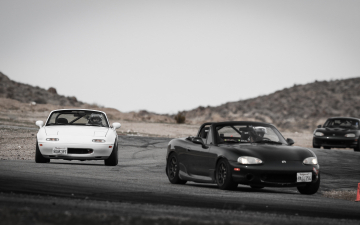 During the development phase of the MX-5 Miata in the early-to-mid ‘80s, Kilbourne worked daily with figures such as Bob Hall, Tom Matano and other champions of a two-seater, Mazda roadster. They spent countless hours gathering data to convince Mazda leadership to move forward on producing the MX-5. Once the car neared production, Kilbourne and his team would work together to hold clinics and market research focus groups with consumers to gain valuable feedback on the car. Kilbourne’s role at Mazda would go on to evolve over his tenure. Kilbourne, now on his 37th year at Mazda, has spent the last 22 years working in accessory planning for vehicles but still reflects fondly on his memorable early years at Mazda. Something he’ll forever remember is a sketch that Shigenori Fukuda, Design Manager of MANA Mazda (North America), Inc., created to thank the great team that brought the MX-5 to market. Even back then, Kilbourne had a feeling that the MX-5 would go on to be a successful vehicle for Mazda.